This is a re-birth of something I did back in 2003. 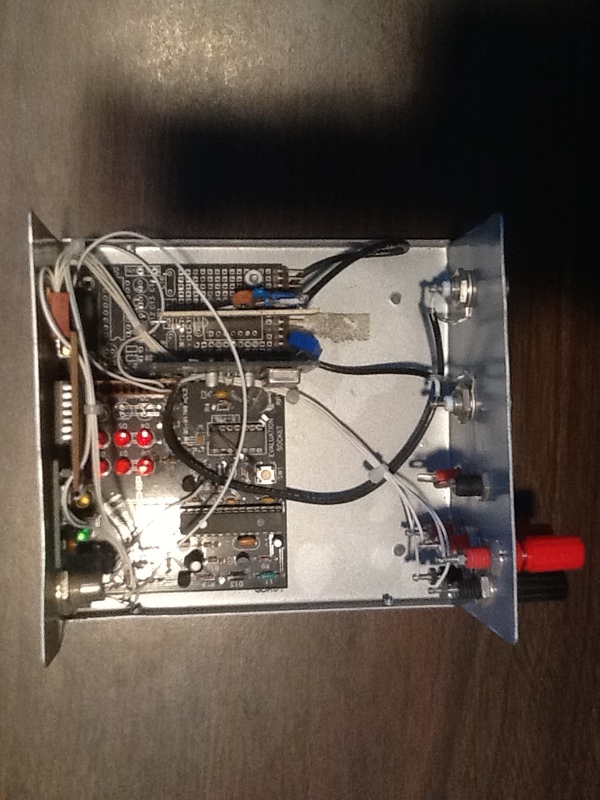 It was a project called the “HF Lab System” and it had a DDS-based 0-50 MHz sweep set (Scalar Network Analyzer, AKA “SNA) as well as built-in fixed 5V and variable 15V power outputs that could be used to power the circuit under development. The system consisted of a hardware unit that had all the RF stuff and power supplies and an RS-232 link to a PC running some spiffy software I developed. I intended to commercialize it, but then I got caught up starting another business and things just languished. After all these years, I’m still in love with that little unit, so I started off to re-design it with newer and lower cost parts available today. My roadmap is to end up with 2 versions of the unit: A very small unit built into an Altoids tin that’s powered from the host PC’s USB port and a slightly larger unit that would contain batteries for power as well as a Bluetooth serial data modem. This configuration would primarily be used with Android phone or Tablet software I intend to develop. It would also have a directional coupler built in for measuring return-loss, so it could be attached at the feed-point of an antenna and operated from the ground. Both configurations use a cheap EBay DDS module, an Arduino Nano with USB, and some interface circuits and RF amplifier that I developed. Total BOM cost should be under $30. As of now, I have all the RF hardware (DDS, RF amplifier, log detector, DC amplifier), as well as the Arduino Nano that controls it, operating on my test bench. I’m working on the Arduino firmware that interoperates with my circa 1993, but still very fine, PC software. Once I get the whole system working, I’ll lay out a PCB so others can reproduce if they wish. I intend to go on to write an Android version and then go back and rewrite the Visual Basic 6.0 PC software with a more modern Microsoft .Net foundation. Looks good Joe. Can’t wait to see more. Hi Joe, I plan to follow your development . I have build the PHSNA poor ham scalar network analyzer version 1 . see yahoo user group PHSNA. I switched off of that project to a user group NAT-SNA, I am currently waiting for firmware 4 and a new pcb suppose to come out this month. This unit is self contain with display screen that show the curve. No PC require but can be used. I will be interested in your unit, for me the ease of operation is a big plus. Both of the above have a learning curve, they are not plug and play, I am willing to go thru a one time set calibration even it is some what complicated for me, but after that it has be easy to use, my memory is not the best, but I do take good notes. Good luck with all your projects. Very nice project! I ma doing a similar one but with a diode detector instead of the log-detector. 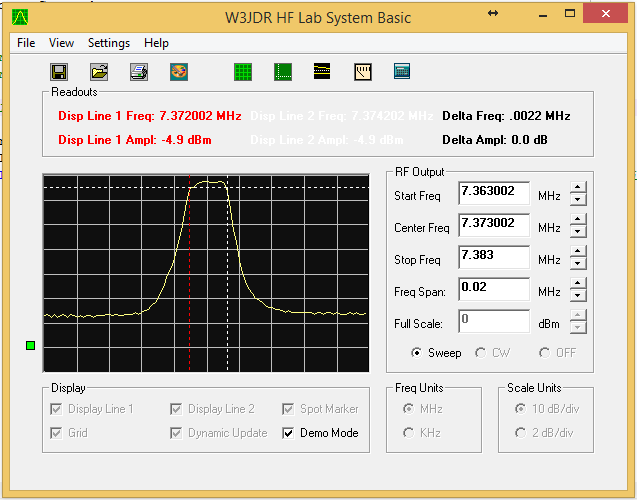 But my dds output (after a buffer ) is higher at lower freq(1mhz) and decreases at 30mhz. How do you tackle it in your circuit/software? Well, the first step in getting a flat response is to have flat hardware. The AD8307 is very good in that respect and it’s only a few $. 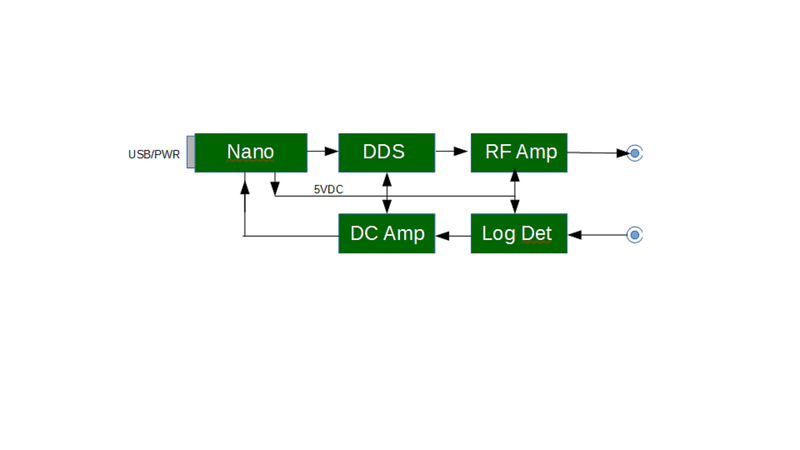 The flatness of the signal generator is dependent on the design of the DDS lowpass filter and the post-amp. My post-amp is very flat up to 50 Mhz; I haven’t evaluated the Chinese DDS module for flatness yet. Also, my software has a ‘normalize’ feature that corrects out any uneveness or un-flatness in the response. To do this, you connect the RF output directly to the RF input and press the ‘normalize’ button. The software saves this trace in a normalization file. On any subsequent test traces, the normalizarion file is subtracted, point by point, from the measured data array and the difference is what gets plotted.